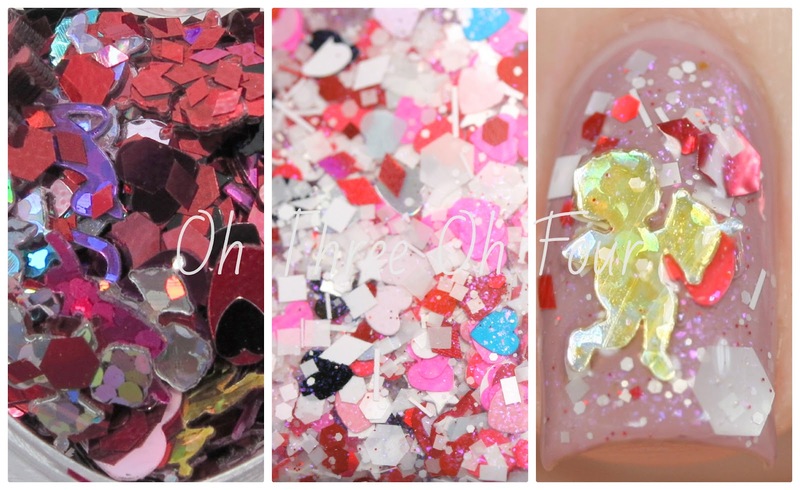 All Heart is a multi-glitter made with assorted matte and satin white glitters mixed with neon pink and a variety of other hearts in pink-violet-shimmered clear base. This duo also comes with added glitter that contains hearts, stars, diamonds, hexagons and cupids as well as other surprises. All nails are 2 coats of Zoya Brigitte with1 coat of All Heart and added extra glitter. Heart Spoken is a violet micro-glitter blend with scattered magenta, purple, blue-violet and red glitters in a pink-violet-shimmered clear base. Shown is 3 coats over bare nail and added extra glitter. This twinset is available now through Lynnderella.com and soon through Norway Nails and Glitter Connect. Make sure to follow the Lynnderella fan pages on Facebook, Twitter, Instagram, Pinterest and Tumblr!